What’s in a name? A lot, if it’s yours! Shaquille O’Neal was the name that broke the ice. Across the United States a great angst was fomenting as families with non-traditional ethnic backgrounds named their children what to many “American” ears were strange sounding names. Recall being stymied in trying to pronounce unique names, those with unique spellings, and especially names from other cultures? Then came the personable, photogenic and talented basketball player named Shaquille. Our ears started to get used to the sound of a name that wasn’t Tom or Dave, Jennifer or Jane. The need for open-mindedness about unique names multiplies as refugees from around the world continue to flee war, hunger and oppression in lands where many names offer a test to American ears. Authors Williams and Mohammed give us a different perspective on the phenomenon. In this colorful children’s book, readers learn what it’s like to be the African boy from Sudan who finds no one in his new country can pronounce his name. After his father is killed in war, Sangoel lives in a refugee camp until the day he and his mother and sister can emigrate to the United States. Everything is new in this new land, and although he is only eight Sangoel is the man of the family, he takes responsibility to help his mother and sister make their way. That proves to be quite the challenge. Hanging on to his name with pride, the boy despairs that no one in the United States — not the social worker helping his family resettle, not doctors, not teachers, classmates, coaches or soccer teammates — can rightly say his name. Some don’t even try — an experience with which many an American with an ethnic last name can surely identify and empathize. People see an “ski,” a “wicz,” an accent mark or an apostrophe in a name and they don’t even attempt to sound out a pronunciation. 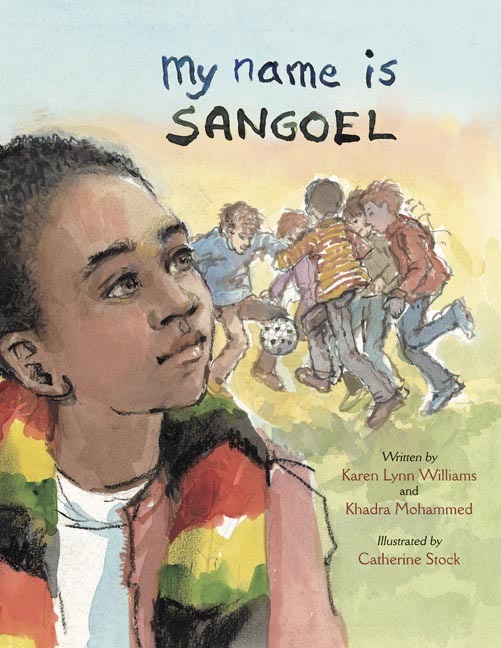 In this beautifully illustrated work from the collection of Eerdmans Books for Young Readers, Sangoel’s creativity enables him to teach others to say his name correctly — and to be accepted in his new environment without leaving behind the heritage of his native homeland. Seraphim, cherubim, archangels and guardian angels. That’s the sum total of my knowledge of angels before working my way through Edward Lucie-Smith’s huge, beautiful coffee table book. Its pages are filled with so much about angels I never knew. “The Glory of Angels” covers the waterfront about the heavenly host. Readers will find there is a hierarchy or “order” of angels — and archangel is only one category. Each level of angel supposedly has a job to do. This pecking order, if you will, appears in neither the Hebrew Scriptures nor the New Testament, but only shows up in the 4th century, so take that as a word to the wise. On the other hand, there are numerous references to angels in both the Hebrew Bible and in the New Testament, and this book reminds us of a number of them through use of well-placed and eye-catching quotations from the Psalms, Genesis, Revelation and St. Paul’s letters. There are pertinent quotes as well from artists, saints and historic figures. But the written copy or text is really secondary in “The Glory of Angels.” The text simple is the skeleton for the real flesh of this book. This is one marvelous gathering of stupendous art. 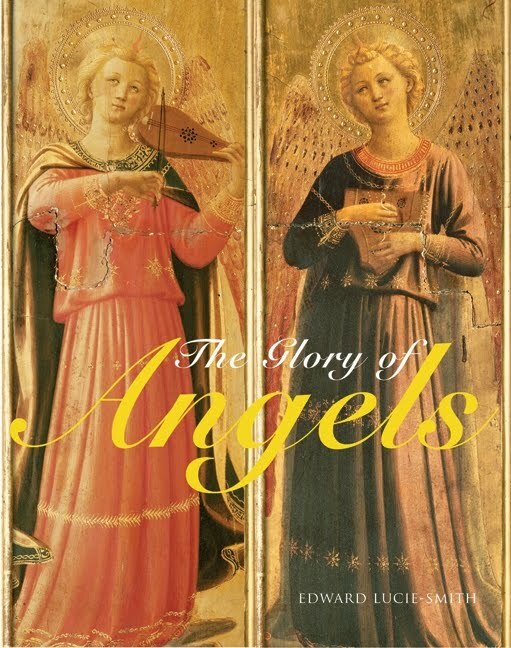 Lucie-Smith may have captured on these pages a majority of the world’s great renderings of angels in art. Paintings, frescoes, tapestry, sculpture, bas relief, icons, stained glass, mosaics, even dishes and jewelry — they’re all here, and by scores of the most famous artists across the ages. A Tiffany window, color-bursting modern works by Kandinsky, Kim, Gauguin, Dali and Chagall, pieces by masters such as Rubens, Giotto, Bernini, El Greco and Manet. One of my favorites is the beautifully framed Nativity done by Della Robbia in brilliant white marble on a stunning blue field. In it, God the Father and a host of angels want from above as the Virgin prays over the Christ Child in the manger. Readers with even a slight connection to religious literature will immediately recognize the sword-bearing angelic figure as the Archangel Michael. More than half-dozen images depict the warrior angel, the best being a two-page spread that carries the near-science fiction scene of “The Fall of the Rebel Angels” that Pieter Bruegel the Elder painted in the 16th century. The characterization of the bad angels turning into grotesque beasts rivals anything from the cantina scene in “Star Wars,” and a golden-clad Michael is prominent in the center of the action. Gabriel appears in any number of renderings of the Annunciation. The angels often come in dreams — to Jacob and St. Joseph, for example –and they come from scores of countries, including China, Japan, Senegal, India and Ethiopia. Angels even illustrate pages of some copies of the Muslim Qu’ran. Not a believer in angels? The 192-page Collins/Design large hardcover offers a chapter titled “What Angels Do For Us” that invites readers to walk through works of art that show that, in the authors words, “we perceive things through our encounters with angels that might otherwise be hidden from us.” A handful of works bring guardian angels into the picture, saving mostly children from danger, but adults as well. The coolest: “Cowboy Angel” complete with chaps, by Delmas Howe. The most different: Rom Mueck’s “Angel,” an elfish male sans clothing perched atop an old stool. In a wonderfully designed and elegantly printed book, two elements stand out. The first is the interesting way the art is identified, with caption information about title, artist and era available on the page or nearby and clear via a numbering and icon system. The second is a superb index — slugged “Picture Resource” — with thumbnail versions of each work, the page on which it appears, the title, artist, time frame, current location, medium and genre. I generally don’t think of fishing for walleyes as work. No. 1, I don’t get paid; No. 2, it’s fun! Yet, on my journey earlier this week to Lake of the Woods on my annual fall walleye fishing adventure, it seemed as though a high level of exertion was necessary to catch fish. Or, perhaps, more accurately, some persistence was required. Normally, by this time of year, walleyes are pouring into the Rainy River from the main lake in waves, chasing shiners that migrate there every fall. So, it’s a matter of picking a spot in the river, anchoring and tossing a jig and minnow overboard. Often, the wait under optimal conditions is less than a minute for a bite — and, a very aggressive, swallow-the-jig type of bite. Not so on this trip. Even though the water temperature was 42 degrees, there weren’t streams of walleyes invading the river. Rather, it was more of a trickle. The good news was, there were enough fish for my friend, Pete Wolney, and I to catch plenty for dinner and bring home a limit. The bad news was, we waited much longer than usual for bites, sometimes up to an hour. But, I am not complaining. After all, I did land a nice, 23-inch walleye, plus we had one flurry on the trip in which we caught eight fish in an hour Tuesday morning. I caught five of those fish, which included back-to-back 18-inchers and a 19-incher, the biggest keeper of the trip. With a protected slot of 19 1/2 to 28 inches, the three nice fish I caught are some of the best eaters an angler could ask for. Interestingly, during the time of that flurry, I had the unusual problem of ice buildup on my rod guides. That, more than anything, made me wonder if Pete and I were nuts for fishing under these conditions. That morning, the mercury dipped to 18 degrees and only got into the upper 30s. So, we spent much of the day fishing in sub-freezing weather. Of course, cold doesn’t bother me nearly as much when the fish are biting. Unfortunately, they weren’t biting at all on the main lake, which is where we decided to try Tuesday morning due to a good report we got before the trip. Last week, anglers were catching lots of fish out on the lake past a narrow opening in a long island called “the gap.” But, strong northwest winds over several days churned up the water and made it dirty, shutting down the lake bite. We didn’t get a bite in an hour and a half and heard similar reports from other anglers who also tried it. Then, we came back into the river and anchored on one of our favorite spots. That’s when we had the eight-fish flurry. That was worth the whole trip for me. But, we caught more fish the next morning to replace what we had eaten the night before. This is our sixth or seventh year of going up in the fall, and we have taken home our limit every time. We worked harder for it this year than other years, but our persistence paid off. So did our previous years of experience on the river. We have several spots stored in our memories that rarely let us down. Plus, we have learned to put our time in when the conditions are tough. We especially target dawn and dusk, when nice flurries often occur. However, this year, our best flurry happened from 11 a.m. to noon. Sometimes, that happens. I’m just glad we were in the right spot when a good wave of fish went through. Now, it’s on to deer hunting, which opens on Saturday. We will face unusually mild temperatures and lots of standing corn. That could make the hunting tough. But, I’m fresh off of a fishing trip where persistence made the difference. I plan to sit in my stand all day Saturday and I’m encouraging my two sons, Joe and Andy, to do the same. Last year, I got my deer at 12:30. Because the rut is in full swing, deer should move even if it’s warm. That’s what I plan to keep telling myself on Saturday. The four-year old and the two-year old sat beside me, their eyes glued to the pages as grandpa read this cute little story. Neither granddaughter moved a muscle until story’s end. That’s a good children’s book. The gist of the tale is that two grandmothers who compete for little Alice’s favor both gift her with bears. The bears, however, don’t get along with one another any better than the grandmas do as they vie to see which one of them Alice likes best. 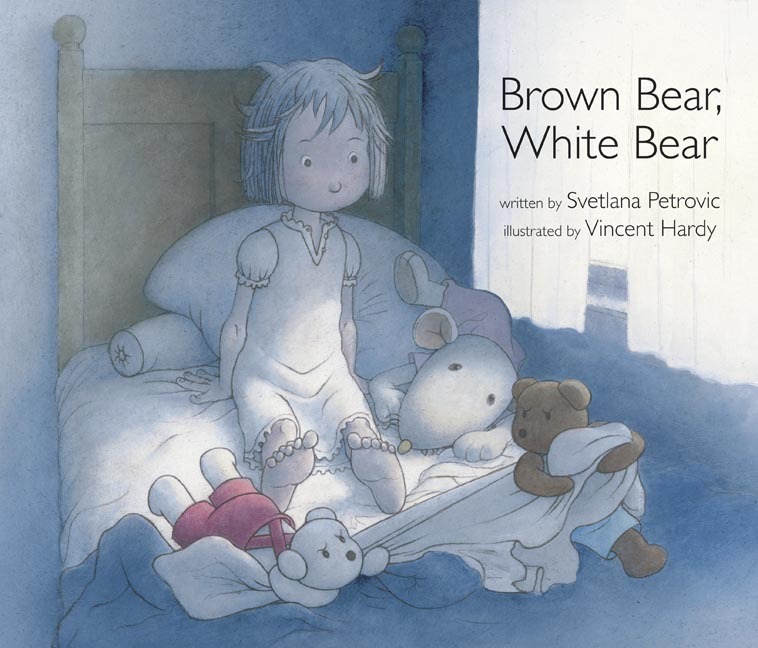 Their teddy-bear version of sibling rivalry escalates to the point where young Alice needs to give both a time out — something the pre-school set will understand — and some good lessons follow. As much as this is a children’s book, adults who pay attention while they are reading it to youngsters have a good chance of picking up on the silliness of their “adult rivalry” for the affection of a child. And I couldn’t help but wonder if Ellie (age 4) and Sarah (age 2) could transfer the bears’ poor behavior toward one another to the way they themselves sometimes treat each other. That’s going to take some work by adults.